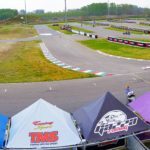 Sestriere (Italy) 9 September 2018 – With the sun out over the mountains of the Piemonte region, Sestriere was ready for the final races of the 2018 Supermoto European Championship season. With the last preparations done on the track in the heart of the city, Sestriere was ready for some racing action. The sunny and good weather conditions made that the people came already early to race track to find a perfect spot in the hills with its spectacular views over the races. 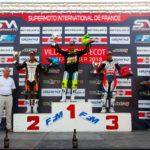 In the S1 class the overall victory went to Phoenix Racing rider Markus Class, while TM Factory rider Thomas Chareyre the 2018 title in the Supermoto European championship. The victory in the S1 Lites class went to Gazza Racing rider Emerick Bunod while the title was taken by Phoenix Racing rider Elia Sammartin. The first race in Sestriere started at 12:00 hours with 23 riders under the sun on the start grid. At the start it was runner up in the championship TM Factory Racing rider Thomas Chareyre who took the hole shot into the fast first left corner of the circuit followed by Phoenix Racing rider Markus Class, SWM Factory rider Mauno Hermunen and the teammate of Class at Phoenix Nicolas Cousin. Right behind the top four it was MTR KTM rider Laurent Fath in fifth position, just in front of Gazza Honda Racing rider Emerick Bunod. The top seven was completed by MTR KTM rider Romain Kaivers. Leader in the championship Degasoline rider Pavel Kejmar started the race from ninth place behind TM Racing rider Diego Monticelli. While the top fifteen came safely through the second very tight corner up the mountain, some riders in the back of the field crashed and had to restart from very last place. In front Thomas Chareyre and Markus Class were pushing each other to the limit and soon in the race the two managed to create a gap to the rest field. Chareyre tried to get away from Class, but the German didn’t give in and kept his frontwheel in the back of the TM of Chareyre. Meanwhile Mauno Hermunen was still in third place but the Finnish rider felt the pressure of the Nicolas Cousin. In the third lap Cousin managed to overtake the Finnish riders for third position in the race. For Hermunen the troubles weren’t over. A mistake in the off-road section in the back of the circuit made him fall back to seventh place as Laurent Fath, Romain Kaivers and Emerick Bunod passed Hermunen. 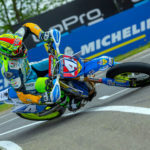 In eight position it was still TM Factory Racing rider Diego Monticelli, who was still chased by Degasoline rider Pavel Kejmar. Behind Kejmar, it was Tuning Motorsport rider Milan Sitniansky was in tenth having a lonely race until he got company from Phoenix Racing rider Elia Sammartin who recovered good from his bad start. In the lead it was still Thomas Chareyre who was leading but there was no rest for the French multi champion. Markus Class was still all over his back. With lap times of 52 seconds, the two leaders soon ha to deal with backmarkers. Chareyre passed time slightly better and faster than Class giving him some room but as soon as the backmarkers were gone, Class closed in again. This was going to be an battle until the finishline. Nicolas Cousin was still in third position, almost 16 seconds behind the leaders. The Frenchman had to watch his back as his fellow countryman Laurent Fath was getting closer and closer. Fath was pushed by his teammate at MTR, Romain Kaivers. The young Belgium rider was in some parts faster than Fath. Kaivers however made a mistake which cost him one place, as Emerick Bunod passed him and took over fifth position. Behind Kaivers, Mauno Hermunen and Diego Monticelli were still battling for seventh position in the race. Both riders were fast but couldn’t get closer to the top five. Monticelli tried everything he could but wasn’t able to pass the Finnish SWM rider. In front the battle for the victory was still on between Chareyre and Class. In the last two laps, Class pushed his Husqvarna to the limit but Chareyre didn’t made any mistake and gave Class no room to pass him. Thomas Chareyre took the victory only 00:594 second in front of Markus Class. The top three was completed by Nicolas Cousin who managed to keep Laurent Fath behind him. Behind Fath, it was Emerick Bunod who finished in fifth. Romain Kaivers completed the top six. Pavel Kejmar finished the race in ninth place. With only two points difference in the championship between Kejmar and Chareyre, the battle for the championship is wide open. The second race of the day and the last of this season started at 14:30 hours in Sestriere. With the championship still open for the top three, you could feel the tension on the starting grid. At the start it was TM Factory Racing rider Thomas Chareyre who took again the hole shot like in race one. Chareyre was followed by Phoenix Racing rider Markus Class, Gazza Racing rider Emerick Bunod and MTR KTM rider Laurent Fath. Behind Fath, Phoenix Racing rider Nicolas Cousin was in fifth place just in front of SWM Factory rider Mauno Hermunen and the teammate of Cousin, Elia Sammartin. MTR KTM rider Romain Kaivers completed the top eight and the Belgium rider was followed by TM Factory Racing rider Diego Monticelli. Monticelli’s race was soon over as the Italian rider had to retire with technical problems in the second lap. Degasoline rider Pavel Kejmar, who was still in the lead of the championship passed the finish line in eleventh position after the first lap. The Czech rider knew that it was going to be a hard race for him. In the lead everything looked like in race one until lap six. Thomas Chareyre made an mistake in the off-road section in the back of the circuit and the Frenchman felt back to fifth position in the race making Markus Class the leader. In the same lap Laurent Fath passed Emerick Bunod in the same section and took over second place in the race. The Frenchman didn’t waste any time and closed in on Markus Class. Emerick Bunod however didn’t want to give up and was soon back at the back of the KTM in front of him. Also Nicolas Cousin managed to pass Thomas Charyere making him fourth in the race. Mauno Hermunen also made an mistake in the lap five and had to restart to race from eight position. 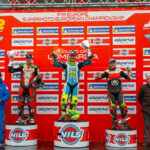 The Finnish rider was passed by Elia Sammartin and Romain Kaivers, both top riders in the Lites class. Halfway the field Kejmar tried to find his rhythm on the difficult track and after a few laps the Czech rider took tenth place from Tuning Motorsport rider Milan Sitniansky. Meanwhile the battle for the lead was still going on between Class, Fath and Bunod, but slowly the German Husqvarna rider managed the create a small gap to his competitors. Behind the top three Thomas Chareyre started to find his rhythm again and got closer and closer to his fellow countryman Nicolas Cousin. Behind Chareyre, two riders, Elia Sammartin and Romain Kaivers, pushed each other hard and together they closed the gap to the riders in front of them. This was the sign for Thomas Chareyre to open the throttle of his TM and with three laps to go, Chareyre took over fourth position in the race. The Frenchman soon created a gap towards Cousin making him safe in the race and the championship. Elia Sammartin and Romain Kaivers didn’t stop pushing but in the end they couldn’t pass Cousin before the finish flag fell. In front Markus Class didn’t make any mistakes and finished in first place, taking the victory in the second race and the overall victory in Sestriere. Second place was for Laurent Fath on 1.479 seconds behind Class. 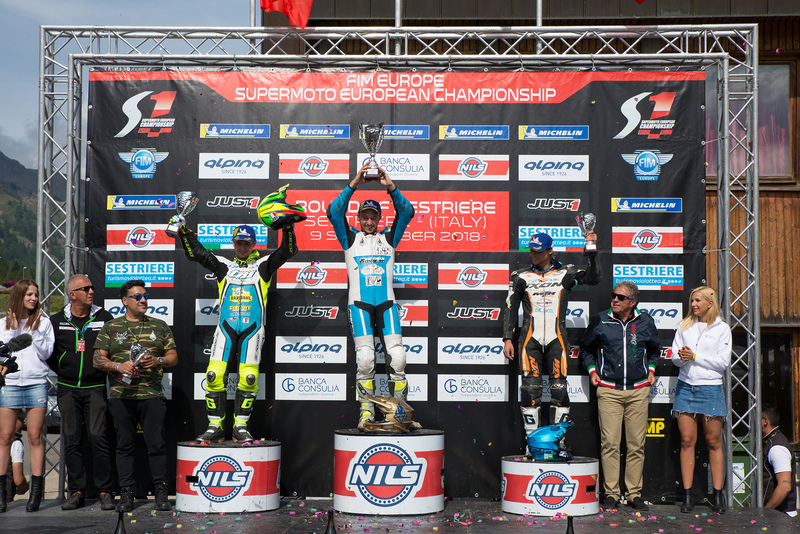 The top three was completed by Emerick Bunod, his best result ever in the Supermoto European Championship. With his third place, Bunod also took the overall victory in the Lites class. Fourth place was Thomas Chareyre and the top five was completed by Nicolas Cousin. Pavel Kejmar had a difficult race number and couldn’t get any higher than tenth position at the end. 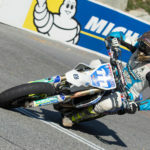 With his first and fourth place in the races today in Sestriere TM Factory Racing rider Thomas Chareyre took the Supermoto European Championship title in 2018. In the Lites class the championship title went to Elia Sammartin from Phoenix Racing. S1 Overall Top Ten: 1. CLASS Markus (GER, Husqvarna) 47pts (22+25); 2. CHAREYRE Thomas (FRA, TM) 43pts (25+18); 3. FATH Laurent (FRA, KTM) 40pts (18+22); 4. BUNOD Emerick (FRA, Honda) 36pts (16+20); 5. COUSIN Nicolas (FRA, Honda) 36pts (20+16); 6. KAIVERS Romain (BEL, KTM) 29pts (15+14); 7. HERMUNEN Mauno (FIN, SWM) 27pts (14+13); 8. SAMMARTIN Elia (ITA, Honda) 25pts (10+15); 9. KEJMAR Pavel (CZE, TM) 23pts (12+11); 10. SITNIANSKY Milan (CZE, Honda) 21pts (11+10). S1 Championship Top Ten: 1. CHARYERE Thomas (FRA, TM) 193pts; 2. KEJMAR Pavel (CZE, TM) 188pts; 3. CLASS Markus (GER, Husqvarna) 187pts; 4. SITNIANSKY Milan (CZE, Honda) 149ptsl; 5. MONTICELLI Diego (ITA, TM) 137pts; 6. SAMMARTIN Elia (ITA, Honda) 134pts; 7. COUSIN Nicolas (FRA, Honda) 115pts; 8. FATH Laurent (FRA, KTM) 110pts; 9. KAIVERS Romain (BEL, KTM); 10. HERMUNEN Mauno (FIN, SWM) 96pts. S1 Manufacturers: 1. TM 240pts; 2. HUSQVARNA 187pts; 3. HONDA 173pts; 4. KTM 148pts; 5. SWM 138pts; 6. SUZUKI 95pts; 7. YAMAHA 46pts; 8. VERTEMATI 6pts. S1 Lites Top Ten: 1. BUNOD Emerick (FRA, Honda) 47pts (22+25); 2. COUSIN Nicolas (FRA, Honda) 47pts (25+22); 3. SAMMARTIN Elia (ITA, Honda) 38pts (18+20); 4. KAIVERS Romain (BEL, KTM) 38pts (20+18); 5. FILIPETTI Gioele (ITA, TM) 32pts (16+16); 6. HUNZIKER Luc (SUI, KTM) 29pts (14+15); 7. PROVAZNIK Erik (CZE, Yamaha) 28pts (13+15); 8. MADISSON Eero (FIN, KTM) 26pts (12+14); 9. GAYA Jaume (ESP, Suzuki) 24pts (13+11); 10. VERTEMATI Michael (ITA, Vertemati). S1 Lites Championship Top Ten: 1. SAMMARTIN Elia (ITA, Honda) 221pts; 2. COUSIN Nicolas (FRA, Honda) 202pts; 3. KAIVERS Romain (BEL, KTM) 173pts; 4. FILIPETTI Gioele (ITA, TM) 157pts; 5. HUNZIKER Luc (SUI, KTM) 127pts; 6. LLADOS Joan (ESP, TM) 123pts; 7. MADISSON Eero (FIN, KTM) 121pts; 8. CIAGLIA Luca (ITA, Honda) 117pts; 9. PROVAZNIK Erik (CZE, Yamaha) 110pts; 10. PALS Patrick (EST, TM) 105pts. 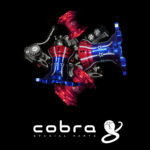 The Round of Sestriere will be broadcasted delayed, by clicking HERE you will obtain the full tv list.